While most of you have been reaping the rewards of surfing the Zenith, those taller and heavier surf kayakers have had to watch from afar as you have been having so much fun ripping up the waves in Ride’s innovative surf machine. 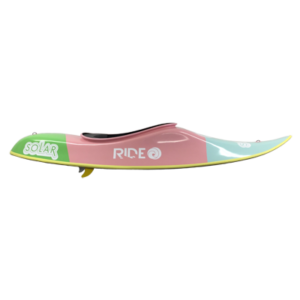 Well, you larger surfers need watch in envy no more… Ride’s new Solar has been shaped, from scratch, for you! We pride ourselves on our approach to creating new models, opting for a CAD design process and CNC plug production – creating a completely new plug, from scratch, every time. While this new machine has been inspired by the Zenith, it is unique in every way! The cockpit is larger to allow easy entry and exit, we have increased the volume to give the user more space and to help float those larger limbs, and Ride have added just a touch more width to help the kayak get onto the plane quicker. The widest point of the Solar is near the hips allowing the surfer to drive tight turns out of the bottom of the wave, straight back up the face and into the air! 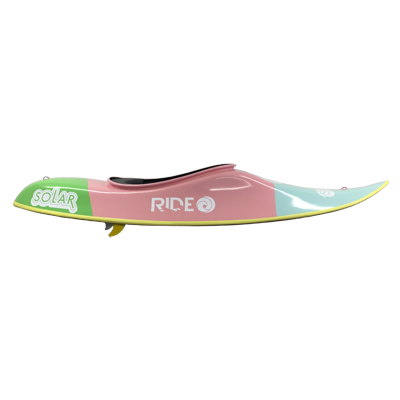 The attention to detail which Ride have put into the front rails will make re-entering the wave after smashing the lip or hitting a technical-aerial-manoeuvre far more forgiving than competitor models on the market. Of course, bottom turns and lip manoeuvres do not come for free and the most difficult attributes for any surf kayak shaper to combine are manoeuvrability and speed. While this new toy has all of the turning abilities of the Zenith, by tweaking the rocker, just slightly, Ride have also managed to unlock some serious speed with the Solar! Be it choppy, fat, hollow or slow, the Solar will accelerate you into your next radical onslaught. Ride’s consistency with delivering high quality products is illustrated in the finish of the new Solar. As with all of the other kayaks in the Ride range, it comes with mini cell foam outfitting and an ergo seat set to your desired height. The thing which impresses us all the most is the integral cockpit rim offering extra strength, improved aesthetics and a better seal for your spray deck. Ride are not only pushing the boundaries of technology with the design, development and prototyping process, but they also lead the way in surf kayak construction. Advanced foam core technology and vacuum bagged epoxy resin systems result in ultra lightweight, super stiff and extremely durable surf products (simpler constructions are available for those on a lower budget). Rather than adding extra volume to the Zenith, Ride have created one of the most exciting new kayaks to be making its way to the world championships later this year. Maybe this time, it will be the smaller surf kayakers watching with envy as the larger surfers out there destroy the waves in this high octane addition to the Ride quiver. The Zenith will continue to accommodate paddlers from 65kgs to 95kgs and the Solar will take care of surf kayakers in the 90kgs to 120kgs weight range. The new Solar will be in high demand so get your order in quickly to avoid disappointment! So I have my solar just over 2 months now, and have not got to surf it nearly as much as I like. The solar is marketed as a big boys Zenith. I also own a Zenith. I’m 90kg, and on the upper end of the weight range for this, and most definitely on the lower end for the Solar. The first thing I noticed was how much room this boat has. Big guys will have no problems in this. As a smaller chap, it is luxury, I have so much space. Compared to my zenith which I need to squeeze into, in the Solar, I can very quickly hop in and out, I have plenty of room for my feet and toes. And with the supplied foam T-Piece, I can still get tight in the boat. I added foam under the seat to bring me right up to the cockpit and use the t-piece to make it a secure fit. The supplied outfitting makes it easy to create a quick custom fit with no messing. The paddling speed of the solar is quite impressive, one thing that had me worried was the extra volume and would paddling out over crashing waves be difficult, I can’t duck dive this like my zenith. However, the extra paddling speed makes it easy and with good timing, it easily hops big foam piles. The width of this boat also makes it extremely stable. So in messy swirly conditions, it poses no problems. I can also quite happily pop the deck and give my legs a rest, re-adjust at any time due to the stability. For me, most noticeably in take off, The extra width and volume means once the wave is with you, you take off and begin to plane very quickly. At my weight, its almost as quick as an eclipse or equinox. Down the line, you will notice the low rocker on this boat keeps it moving fast, it travels easily over lumpy sections of the wave, and if you hit it off the foam, the extra volume floats it easily over the foam and keeps the momentum going. Being used to a zenith, I was worried I would struggle with the extra width. On day one I did, not because the boat doesn’t turn, just because nothing can turn like the Zenith. Once my outfitting was right, I got this boat turning and driving no problem, where the Zenith cuts through a turn, I find the Solar confidently drives through the turn, the extra volume keeping it on top of the water and maintaining all that speed. I got flipped fast a few times, but now that i’m used to this, I love that instant drop and drive I get from a boat that accelerates instantly without needing to shed any water. Having very tight outfitting has helped me keep that rail from tripping when I turn tightly into the pocket. The extra width also creates a cool feeling of release if you really crank a turn hard, the whole boat easily lifting through the turn showing all the hull. when you hit the lip, or hit a foam pile, there is a very definite Ping or Pop feeling as the boat goes loose and rockets over the foam or burst through the lip. Its awesome. It lets you know something great is happening, and is a very unique feeling to this boat. Over 95kg. Buy a Solar. Simples. Under 95kg,Expert Paddler – want the best turning boat out there – buy a zenith. After 4 weeks with my solar, I was happy to paddle it in heavy over head waves in a comp and it took me to third among a difficult international field. 7 weeks later, I was again confident in my solar at the worlds. I’m looking forward to more time in this boat and really figuring it out.